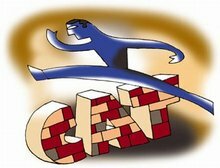 The Common Admission Test (CAT), rated as one of the world’s most demanding entrance examinations for any graduate institute, just got tougher with the Indian Institutes of Management (IIMs) stating that even 0.1 percent less in the degree examinations will rule out a candidate from writing the test. The IIMs have clarified that if a candidate has even obtained 49.9 percent marks in the degree examinations, he will not be eligible to appear for the examination. The cut-off marks for being eligible for the CAT examination will stand at 50 percent for the general category and 45 percent for SC, ST and PWD candidates and will not be rounded off under any circumstances. The rule is likely to affect lakhs of IIM aspirants across the country who have failed to reach the 50 percent mark even by a whisker. The CAT committee is also in consultation with a leading global online test company, Prometric, in chalking out plans to conduct the annual examination online.